We will be posting pictures with descriptions from the Fall 2009 NACADA Conference. Here is the first one. Brian Buckwald (on the left) has been in the field of academic advising for four years. He got his start in advising in a centralized freshman/sophomore advising office. He fell in love with advising when he was able to really connect with first generation, at-risk, and undeclared undergraduate students. 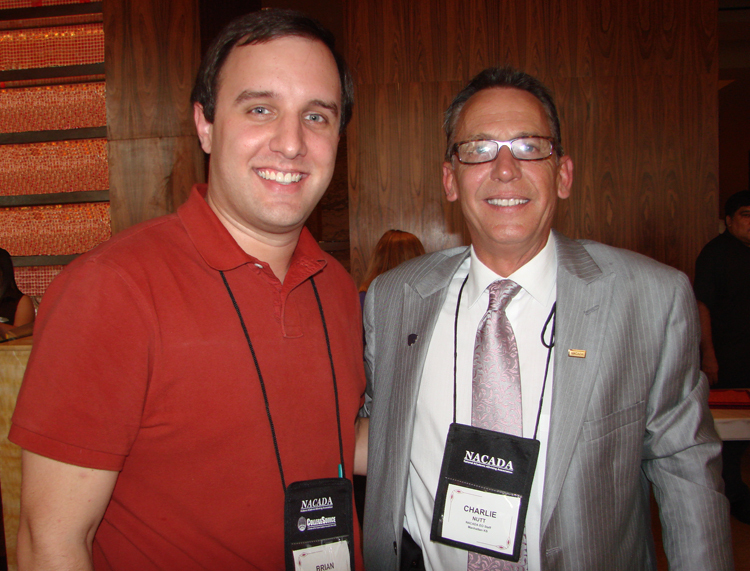 His love for advising was sealed when he attended his first national NACADA conference. In his current position, he lead the advising program for 650 undergraduate sociology majors at Georgia State University. GSU is a large urban research institution in downtown Atlanta. As a discipline specific advisor, he solicits and transitions new majors into the program, advises upper level coursework, provides career advising and graduate school planning, and coordinates the department internship program. “I aspire to be a college or university-wide advising administrator and joined the program to advance my career. I initially started my graduate education in a professional counseling program, but I didn’t think it was adequately preparing me to be an advising administrator. Joining K-State’s Academic Advising program was one of the smartest career development decisions I have ever made. I acquired the skills and confidence to advocate advising initiatives to university administrators, faculty, and advising colleagues. The program helped me create manuals, guides, and tools that I could immediately put to good use in my current position. I have enjoyed the coursework to the point where I feel I have started a new personal and more scholarly-like relationship with academic advising. I am confident when I complete the program I will be a highly competitive candidate for an advising administrator position.